Welcome to Emerald Beach! Emerald Coast by Owner is proud to be your premiere vacation rental service for this area, offering you a number of elegant properties! Emerald Beach is a great place to vacation, with all the amenities such as each unit providing guests with amazing views, ranging from 1-3 bedrooms, washer, dryer, full sized kitchen, beautiful community pool that's also child accessible, poolside tiki bar, Skybar and there's even a Starbucks on sight! If the resort doesn't convince you, the area must! There's so much to do a week might not be long enough! Some popular things to do in the area include swimming with dolphins, parasailing, deep sea fishing, renting jet skis, boat tourism, helicopter tours, water parks, amusement park and state parks! If you plan on shopping for souvenirs or just about anything else while you're here, be sure to stop by Pier Park! Pier Park is a shopping center with a great amount of stores and restaurants, offering you a large variety to shop for whatever you desire! Browse Emerald Coast by Owner today and check out our different listings in the beautiful Panama City. Scroll down to view our listings in Emerald Beach! 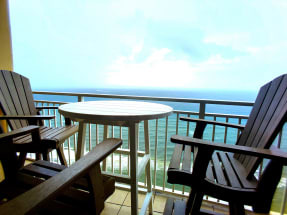 When you book with Emerald Coast by Owner, we put you in direct contact with the property owners or managers. Contact them directly with any questions!